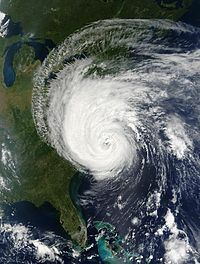 The effects of Hurricane Isabel in New Jersey in 2003 were overall moderate, limited to fallen trees, two deaths, and $50 million in damage (2003 USD, $59 million 2008 USD). Hurricane Isabel formed from a tropical wave on September 6 in the tropical Atlantic Ocean. It moved northwestward, and within an environment of light wind shear and warm waters it steadily strengthened to reach peak winds of 165 mph (265 km/h) on September 11. After fluctuating in intensity for four days, Isabel gradually weakened and made landfall on the Outer Banks of North Carolina with winds of 105 mph (165 km/h) on September 18. It quickly weakened over land and became extratropical over western Pennsylvania the next day. Several days before Isabel made landfall, there existed uncertainty in where the hurricane would strike. At least one computer model predicted a landfall on New Jersey, and as a result services across the state thoroughly prepared for the hurricane. Isabel passed 215 miles (350 km) southwest of the state, though its large wind core produced tropical storm force winds across much of the state. The winds downed hundreds of trees and power lines, leaving hundreds of thousands without power. A falling tree killed one person. Hurricane Isabel produced rough waves and a moderate storm surge along the coastline. One person was killed from the rough waves, and at least 50 locations along the Jersey Shore reported beach erosion from the hurricane. 44 hours before Hurricane Isabel made landfall on the Outer Banks of North Carolina, the National Hurricane Center issued tropical storm watch for the coastline from Little Egg Inlet southward into the Mid-Atlantic. A day later, the watch was extended northward to Sandy Hook. When Isabel was 26 hours from making landfall, the watches were changed to tropical storm warnings, and 10 hours before it struck land the National Hurricane Center issued a tropical storm warning for the remainder of the New Jersey coastline. The National Hurricane Center also briefly issued a hurricane watch for the New Jersey coastline. While over the western Atlantic Ocean as a Category 5 hurricane, forecasters predicted Isabel would move northwestward and within five days be at a position 170 miles (275 km) south of Cape May as a 115-mph (185-km/h) major hurricane. By four days before the hurricane struck land, at least one computer model predicted Isabel would strike New Jersey. News stations were stationed with crews along the Jersey shore several days in advance of Isabel to provide breaking news and live conditions. Many residents prepared their houses by boarding windows and purchasing emergency supplies. The Sussex County chapter of the American Red Cross advised local high schools to be on stand-by as potential shelters in the event evacuation occurred. Emergency coordinators in several counties were on alert, though none issued evacuations. In preparation for anticipated power outages, the Jersey Central Power and Light company arranged to receive more electrical crews from its parent company, FirstEnergy. Other utility workers from various locations as far as Canada left for the state in the event of power outages. Several flights in and out of the state were delayed or canceled, and the Cape May-Lewes Ferry canceled travel across the Delaware Bay during the duration of Isabel. In Atlantic City, casino workers prepared for coastal flooding by placing sandbags at boardwalk entrances. New Jersey Transit workers secured its buses, railways, and light rail equipment. To ensure service would remain accessible during and after the hurricane, NJ Transit prepared backup generators, pumps, and chainsaws, with workers inspecting trains and the paths of the lines. FEMA mobilized and dispatched an Urban Search and Rescue Task Force of 28 people to the state for possible rescue duty. Days before the storm made landfall, the Salvation Army prepared food and aid for potentially affected citizens. In anticipation for the effects of Isabel, Governor Jim McGreevey declared a state of emergency, which allowed the Federal Emergency Management Agency to deal with the situation. Isabel produced a storm surge along the New Jersey coastline of up to 6.5 feet (2 m) in Cape May. Higher amounts occurred along the Delaware River, peaking in the state at 10.6 feet (3.2 m) in Burlington. At its closest approach, Isabel passed within about 215 miles (350 km) of the state, and as a result the outer rainbands produced light rainfall. Wildwood along the southeast coast reported 1.3 inches (33 mm) of rain, while Lincoln Park in the northern portion of the state recorded 2.07 inches (52 mm) of precipitation. The large wind field of the hurricane produced moderate winds across the state. A shoal in the Delaware Bay experienced sustained winds of 54 mph (87 km/h) with gusts to 71 mph (114 km/h). Cape May reported tropical storm force winds with gusts to 61 mph (98 km/h), while Newark in the northern portion of the state experienced gusts to 44 mph (71 km/h). Hurricane Isabel produced slightly above normal tides and rough surf along the Jersey shore, killing one surfer off of Wildwood Crest. The combination of gusty winds and the heavy surf produced moderate beach erosion along much of the coastline, primarily to beaches facing southeastward. In the Delaware Bay and River area, no significant erosion was reported, though coastal flooding from the hurricane washed out a road and destroyed the deck of a house in Baypoint. In Cape May County waves eroded the beaches by up to 4 feet (1.2 m) in Ocean City and Avalon, with several cities experiencing a loss of dunes and geotubes in Whale Beach being exposed. Waves from Isabel in Atlantic County resulted in light damage, minor coastal flooding, and slight beach erosion. The beaches of southern Ocean County experienced a loss of 3 to 4 feet (0.9 to 1.2 m) of sand, while locations further to the north experienced only minor erosion. Most coastal areas of Monmouth County reported eroded beaches by up to 4 feet (1.2 m), with Union Beach losing about 5,000 sq. feet (465 sq. m) of sand. Moderate wind gusts throughout the state downed hundreds of trees, tree limbs, and power lines. Over 382,000 people were without power, one of the worst power outages on record for area utilities. Downed trees and power lines closed major streets and schools in Union County. One downed tree greatly damaged a house in Middletown, and in Hudson County several trees fell onto and damaged cars. A downed tree in Englewood injured a woman when she was struck, and a woman in Independence Township was killed when a fallen tree landed on the vehicle she was driving. Strong winds from Isabel blew out the windows in an office building in East Rutherford, causing injuries to two women when they were struck. Throughout the state, damage totaled to about $50 million (2003 USD, $59 million 2008 USD). ^ a b c d e Jack Beven & Hugh Cobb (2003). "Hurricane Isabel Tropical Cyclone Report". National Hurricane Center. Archived from the original on 2013-11-14. Retrieved 2014-02-07. ^ National Oceanic and Atmospheric Administration (2004). "Hurricane Isabel Service Assessment" (PDF). Retrieved December 11, 2009. ^ Lawrence (2003). "Hurricane Isabel Discussion Thirty-Two". National Hurricane Center. Retrieved December 11, 2009. ^ Avila (2003). "Hurricane Isabel Discussion Thirty-Three". NHC. Retrieved December 11, 2009. ^ Tom Layson (2003). "TV News Anchors Prepare for Hurricane Isabel". Poynter Online. Archived from the original on September 27, 2007. Retrieved December 11, 2009. ^ a b Pat Mindos (2003). "Eyes on the storm; Hurricane could hit New Jersey by Thursday". Herald Staff Writer. Retrieved December 11, 2009. ^ American Radio Relay League (2003). "Amateur Radio Operators Ready for Hurricane Isabel". Archived from the original on September 30, 2007. Retrieved December 11, 2009. ^ a b Associated Press (September 18, 2003). "State-by-State Look at Isabel's Effects". Fox News. Retrieved December 11, 2009. ^ CNN.com (2003). "Isabel snarls air traffic in the East". Retrieved December 11, 2009. ^ New Jersey Transit News (2003). "NJ Transit Preparing for Hurricane Isabel". Archived from the original on September 30, 2007. Retrieved December 11, 2009. ^ Office of the Department of Homeland Security (2003). "Homeland Security Prepares Federal Response Assets in Preparation for Hurricane Isabel's Landfall". Archived from the original on October 21, 2009. Retrieved December 11, 2009. ^ Tricia Pellegrini (2003). "The Salvation Army NJ Division Prepares for Hurricane Isabel". The Salvation Army New Jersey Division. Archived from the original on September 30, 2007. Retrieved December 11, 2009. ^ Mike Derer (2003). "More than one million people lose power as Isabel roars ashore and spreads out". Associated Press. Retrieved December 11, 2009. ^ Gorse & Frugis (September 19, 2003). "Post Tropical Storm Report on Hurricane Isabel". Mount Holly, New Jersey National Weather Service. Retrieved December 11, 2009. ^ a b c d National Climatic Data Center (2003). "Event Report for New Jersey". Archived from the original on May 19, 2011. Retrieved December 11, 2009. ^ "Coastal Storm Survey" (PDF). New Jersey Department of Environmental Protection. September 19, 2003. Archived from the original (PDF) on February 12, 2012. Retrieved December 11, 2009. ^ a b National Climatic Data Center (2003). "Event Report for New Jersey (2)". Retrieved December 11, 2009. ^ Ben Mcconville (September 20, 2003). "Isabel's trail of destruction leaves 16 dead". The Scotsman. Retrieved December 11, 2009.